By Paul Williams 18 Comments - The content of this website often contains affiliate links and I may be compensated if you buy through those links (at no cost to you!). Learn more about how we make money. Last edited July 28, 2015 . A while back, Peter did a review of Mint.com, a free online solution for tracking your finances, and then just this year, he updated that Mint review. Mint lets you see all your accounts in one place, captures all of your transactions, and puts the data into a ton of great looking charts and graphs so you can see how you're spending your money. I use it as a way to check all my accounts at once and look at the historical trends in our finances so I can make adjustments as needed. Recently, Mint released a new goal setting feature to help its users set up goals, link the goals to their accounts, and follow up with steps to achieve the goals on schedule. I have to admit I've not been using the feature since I do my own goal setting because I'm a financial planner. Peter asked me to take a look at Mint's goal setting feature and share my thoughts. What I like about Mint's new goal feature is that it makes incorporating your goals into your finances easy. Because you can link goals to specific accounts, your progress gets updated when the account balance gets updated. This makes for a quick way to look over your list of goals and find out where you stand. Mint's goal feature excels at helping you set up short-term and mid-term goals like an emergency fund, buying a car, or taking a trip. It'll help you set an amount so you know how much your goal should be. For example, when you're setting up a “Buy a Car” goal Mint will provide you with Kelley Blue Book values on the car you'd like to buy. Then you just link up any account you'd like to use for the goal (or Mint can suggest a good option or you can wait until later). Mint's goal feature will then let you set a date and help you figure out how much you'll need to save each month to reach your goal on time. Once you've got your goals set up, Mint provides you with a nice graphical picture of where you are in your progress and provides some additional steps you can take to reach your goal. You can also add your own tasks to the checklist to make sure you don't forget anything. Mint shines in this area and it shows. Despite the good aspects of Mint's goal setting feature, there were several problems that I found. Now, being a financial planner, I'm probably giving them a harder time than most people would but I have very good reasons. I mentioned above that Mint's goal feature is helpful for setting up short-term and mid-term goals. I left out long-term goals because of problems with the way they calculate the goals. For example, the retirement goal assumes you'll get a constant rate of return every year. It also assumes the same return for your whole life as far as I can tell. So if you say your investment style is “Aggressive Growth” then Mint assumes you'll get a 9% return every year until you retire and every year after you retire – even when you're in your 90's! I don't know many people who want to still be in an aggressive growth portfolio just a few years before retirement. And I don't know anyone who can get a constant 9% rate of return every single year. The markets just don't work like that. I ran into different problems with the college goal. It looks like they assume a 0% rate of return, even if your child was just born today. They also assume a tuition inflation rate of 4% but historically it's been more like 7%. You can change the inflation assumption manually, but there doesn't seem to be any way to incorporate a rate of return. These may seem like minor quibbles, but I assure you they're not. These are major factors – especially in long term goals like college and retirement. I figured Mint would simplify the retirement calculator, but I'm quite disappointed with the college goal. I couldn't check out Mint's “Get Out of Debt” goal because it wouldn't pull up my debt accounts. I have a student loan which should have been an option to use for the goal, but it didn't come up at all. I'd say that's a major problem! I also kept getting an error when I was playing with the retirement goal. Every time I'd get to the third step I got a message that said something about having a goal date set past 2029. While retiring in 19 years doesn't sound too bad, I think it's a little out of range for most people. The goal calculator seemed to work fine after I dismissed the error message, but why should I be getting it in the first place? It just detracted from my overall opinion of the goal feature. I think Mint's new goal feature is great if you have a short-term goal like building up your emergency fund or taking a trip. But I wouldn't use it as a retirement planning or college planning tool by any means. It's just not robust enough to handle these more complicated calculations, so please don't rely on it for these very important decisions! Have any of you used Mint's goal feature? What did you think about it? (I'm especially interested in the “Get Out of Debt” goal since I wasn't able to use it.) Let us know what you think in the comments below! Considering trying out Mint.com? It's a free product so you've got nothing to lose. Sign up here. then come back and tell us what you think! I’ll be interested in hearing your readers’ experiences with the goal features that did not work for you, especially the “Get Out of Debt” goal. I have always viewed Mint as the antithesis of what a personal finance management tool should be but they are innovators to be sure if somewhat misguided IMHO. What is it about Mint that makes you think it’s the antithesis of what a PF management tool should be, Bill? I’m interested in hearing more about what you meant by that. A wise man once told me, “if you’re not paying for a service you’re not the customer, you’re the product.” This is definitely the case with Mint and why Intuit forked over a boat load of cash to acquire Mint. Mint is the Google of the consumer loan market. As such, their corporate interests do not align with those their users but with the interests of the lenders whom they grant access to the users’ and to some degree I’ll beat their financial data. There’s nothing wrong with that so long as Mint’s users understand it. Mint is a flashy app that entices users but from my experience as a user and those of countless other Mint users I’ve spoken with it only works well for users who have accounts with those institutions whom Mint (and Intuit) deem profitable enough to service. Again there’s nothing wrong with that. As I stated Intuit paid a lot for Mint and needs to recoup their investment. Everything I’ve mentioned to this point is to Mint’s benefit, not the benefit of the users but what’s most disturbing, at least to me, is that use of Mint can have a potentially devastating effect on a certain class of user, those who are in trouble financially and who turn to Mint with the hope of gaining control of their finances. Such users are enticed by Mint to consolidate credit card debt which creates available balances on existing cards which the normal consumer will then exhaust either with new purchases or to stave off other debt or bankruptcy, and are thus left with little more than another card or loan payment. Intuit knew that when they bought Mint and the financial institutions who are the true beneficiaries of Mint know that too and are willing to pay Intuit well to gain access to Mint’s users. For the 15-20% of US citizens who are making good use of credit and don’t mind that over 40% of deposits in the US are controlled by 4 national banks Mint is a wonderful tool. For the rest of us, Mint rapidly looses its appeal the further down the financial strata you fall. I can see what you’re saying, Bill. I guess I’ve never thought about it much because I just ignore Mint’s suggestions. But that’s because I have control over my finances and spending and already know I’ve got my money in the right places (Vanguard, ING Direct, etc.). I’m happy with what I’ve got so I’m not looking to change anything. I’m just freeloading on Mint’s ability to easily track transactions and trends in my spending. I guess I’m banking on personal responsibility to win out, especially if someone starts using Mint for the reasons I suggest. I think you bring up some great points in your post. However, I think Mint.com is simply what you make of it. Sure, you can potentially get burned (but is that any different than the countless credit card offers that come through the mail to consolidate your debt? And Mint.com isn’t encouraging the users to spend the newly regained credit allowances anymore so than a Target commercial…). I realize this analogy doesn’t fully translate, but your critique of Mint is similar to a critique of sugar. Sugar can be good – it sweetens tea and helps make great cookies. However, sugar can also be bad if used the wrong way – such as drinking too much soda, or eating too many of those great cookies. Sugar isn’t necessarily good or bad – it’s what you make of it. Same with Mint.com. Wise usage of it is good. I suppose people can get potentially harmed (but again, I don’t see Mint.com helping this any more than the US Postal Service). I’ve also yet to have anyone tell me that Mint.com hasn’t been able to sync to their banking institution, including local banks. But my limited sampling size could be wrong on this as well. I think what is truly at the heart of your post is the behavior of the user. Of which Mint.com can be of help if the user actually uses the budgeting tools available to them. People will make bad decisions about money – regardless of their usage of Mint.com And people will also make good decisions about money – regardless of their usage of Mint.com. Mint.com isn’t the issue – it’s merely a tool. I have also wrestled with this lack of interest assumption in the goal setting feature of Mint. I can rationalize it like this. The goal progress is updated daily. If you are getting good returns then it will say you are ahead and when you rebalance you can dial back your investing in that area, or vice versa. Besides, the only guaranteed returns right now are essentially zero. Otherwise, the worst thing that can happen is you would save too much. Nonetheless, I still wish it had that feature. Nice post, Paul. The aspect of Mint’s Goals feature that I like the most is its seamless use of ING Direct’s Orange savings accounts. I separate out all of my various savings within ING into distinct accounts (with distinct account numbers), and so Mint’s Goals can sync directly into these ING different accounts. i completely agree with you on the limitations of their long term goals. I hadn’t picked it apart to the degree that you did. And as a fellow financial planner, would also add that there are way too many individual variables to do an in depth retirement forecast plan. All in all, I’m a fan of Mint and of their Goals features, but agree there are certainly limitations that should be better disclosed. Thanks, Jeremy! I agree the integration with segregated accounts in ING Direct is great for those short-term type goals. I’m glad you agree with me about the drawbacks with the long-term goal tools. I wasn’t trying to be hard on Mint – just realistic. I still like Mint for tracking my transactions and income/spending trends, but I probably won’t be using the Goals feature much. I have to admit that I haven’t really used the goals feature of Mint before, mainly because of how I use mint. I haven’t really used it as a budgeting or forecasting tool, but instead as more of a “quick look” tool that I can check from anywhere to get a picture of our overall financial situation.. For more in depth budgets/etc I use Microsoft Money, and excel spreadsheets. But for mint, it’s handy to be able to check all your accounts in one place when you’re away on vacation or something, and don’t need all the in depth tools. Sounds like their goals and long term planning features may need a bit more work, but I still love mint.com, and may give those tools a try sometime soon.. Great review Paul! Yeah, Mint is definitely useful as a quick overview. I find it’s in-depth enough for me. Have you played around much with the trends section, Peter? It’s definitely not as customizable as Money or Excel spreadsheets, but I’ve been able to find what I need most of the time. Not being able to set an interest rate for a simple goal with a linked savings account makes its projections of when I’ll meet the goal pretty useless. Wouldn’t have been hard for them to at least let us put in a rate. You’re right. It will affect the initial estimated date of completion, but keep in mind that the goal progress will be updated as interest is credited to your linked accounts. It’s not a great solution, but at least your interest doesn’t get completely ignored. Great review. Thanks, this seems like something cool to check out. This review comes off very biased against mint’s goal feature. It actual MUST be. The author is a financial planner, admitting that mints goal setting tools are good would also mean admitting his profession is obsolete. Because of the way human psychology works very few people would make that admission. The basic takeaway of this article is “mint is good for simple goals, but for long term and complex goals its not”. In other words, you still need your certified financial planner. And really this makes scene, its kinda hard to claim that simply dividing your goal by a number of months needs any expertise. This is my thoughts about the shortcomings he mentioned. All of them were part of the feature that was designed to help you estimate your savings goal. In the case of the home buying, its trying to help you guess at what would be a good down payment. I think erring on the side of aggressive is a good choice. It errs on the side of a larger down payment. If someone over saves, then realizes they can only afford X house, its better than coming up short. For the retirement goal, i found the calculator very useful. The important thing it did was project your desired salary into the future given inflation and retirement age. I found this extremely useful. It helps you pick a saving goal. Once the dollar amount is set, it ignores that growth amount. Notice it uses the “total savings” needed number, not the expected contributions number. If your investments are not preforming up to the expectations you set, the goal will fall behind and fast. Wow, Mitch. Really? I actually never suggested that you need a Certified Financial Planner(t) professional to help you calculate those goals. I was just saying that Mint’s goals feature is not accurate enough or robust enough to handle those calculations. There are plenty of other free online calculators that do a much better job of handling these situations. My review of Mint had little to do with the fact that I’m a financial planner. It had everything to do with the fact that Mint’s goal calculators simply aren’t up to snuff if you’re going to base your entire financial plan on them. Here are my thoughts on your thoughts. 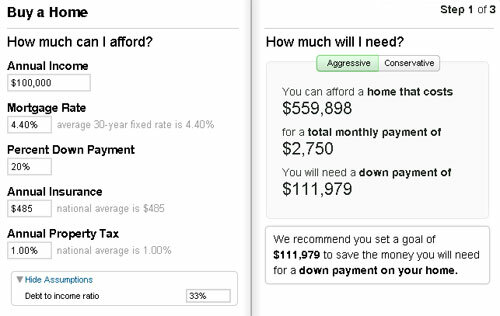 The aggressiveness of the mortgage calculator has nothing to do with the down payment. The “aggressive” setting merely increases the debt-to-income ratio and ends up telling you that you can afford much more house than what is likely true. Any retirement calculator worth its salt will project your desired income into the future given an inflation rate and your retirement age. It would be a major flaw if it ignored inflation. Also, a good retirement calculator will let you know how much you need to save in total and what you should contribute each year to get there. Finally, you should be redoing the calculation every few years to make sure you’re on track. I’m not sure you really read my concerns with Mint’s retirement calculator as they had nothing to do with these factors. If you’re going to accuse me of being dishonest or biased, please contact me first so we can discuss it together. Then, if you’re not satisfied, you can go into the public and share your argument as to why my review was flawed. Unfortunately, your argument has no basis in reality or fact. I would actually encourage people to learn enough about personal finance so they don’t need a financial planner. I do not believe everyone needs to hire a planner, but I know some people prefer it and others can actually use the help because of their complex situations. That’s the only reason I have a career. True financial planners are not obsolete because the government keeps the laws complicated enough that it’s helpful to have someone whose job is solely to figure out the best way to handle your finances based on the laws (same goes for financial products). I just bumped across this thread as I have been using Mint.com for a little while and began to wonder if I shouldn’t compare before I dump my time into tweeking it to my satisfaction. I’m someone who’s coming off of Dave Ramsey’s Financial Peace University classes and also hired a financial planner last year (Dave Ramsey Certified) to help us figure out how to get our heads above water since my husband is in the mortgage business and we have taken such an enormous hit in the last 5 years it’s been overwhelming and very complex. I find the software to be great, but I don’t put a huge amount of weight on the projections. Actually, Dave Ramsey has the best ones on his website (mymoneymakeover.com), and all I’ve done is print his off, put them in a notebook, and then use mint.com to help me fill in all the blanks. I’ve never budgeted like this before, so Mint is great at helping me see at a glance where I am. I’m not asking the software my goals, I decided those right before I decided to use the software. I feel that the software actually helps me to reach my goals. If I want to stick in some saving goals (Dave says 3 to 6 months in emergency, Suze Orman says 6 to 9) I can use it for that, but I think most people arrive at their goals before they use the software for the most part. It’s always fun to play around with software, but Dave has actual formulas to plug in based on your age, the age you wish to retire, the amount you want to have, as well as the age of your children, the years until college and figures in inflation (at a rate of 8%). It’s nice because he actually has what calcuation to figure in to help you set a realistic goal, but not ACTUAL. I think one of the basic things you learn about budgeting is that these goals are estimates, not ACTUAL. Isn’t that what budgeting is?? Track, tweek, spend, track, tweek, spend. Budgeting is 5% plugging in numbers and 95% analyzing those numbers. If you are over your head, you can play with software calculators on line, but if you are serious as a heart-attack that you have to get some goals met or you’re screwed, then you need to seek out a solid financial planner. I find planners to be difficult to find in regards to just helping all of us baby boomers who are accustomed to living “on a wing and a prayer”. I’ll be honest, I’m 48 years old and I’m just learning to budget. So I really need professional help. I’m going nuts trying to figure everything out, so I love Mint.com’s software because it helps to take the pressure off my overstressed brain on how to make up for lost time, and how to make up all the retirement we’ve lost in the crash, and how to buy the kids cars, and send them to college. Bouncing from website to website, reading blogs and reviews, listening to experts, reading books, these are all things I am committed to doing now to catch me up on where my parents should have guided me to years ago; sound financial habits I can pass down to my kids. What keeps me going is knowing that my kids are watching me. They will tell their kids some day “I remember when my parents lost everything, I learned so much from watching them during that difficult time.” These are the motivators that stay in my head as I continue to read absorb, track, assess, analyze (repeat). I use a Google spreadsheet to plan the year to see where I will be at the end of the year. That helps me fine-tune my monthly numbers. Then let mint track my numbers as the year goes by. This seems to be working, but it would be nice if mint could provide same kind of a feature so I don’t have to manually transfer the numbers to my Google spreadsheet at the end of each month. I recently switched to Mint after my credit union changed their money management for the 2nd time, leaving me hanging without being able to retrieve my financial data. My problem with Mint Goals is that when I update my Goal of “paying off credit cards” if I make a payment change in any account, it automatically restarts my entire goal one month later. For instance, at the beginning of this month, Sept 2017, I paid more on a credit card than planned, now it has restarted my goal for October 2017. I totally lost all of the payment advice for the remaining of September. Buggers! !